Three persons have been arrested from Delhi airport who were trying to smuggle high quality Agarwood worth crores of rupees to Kuwait. 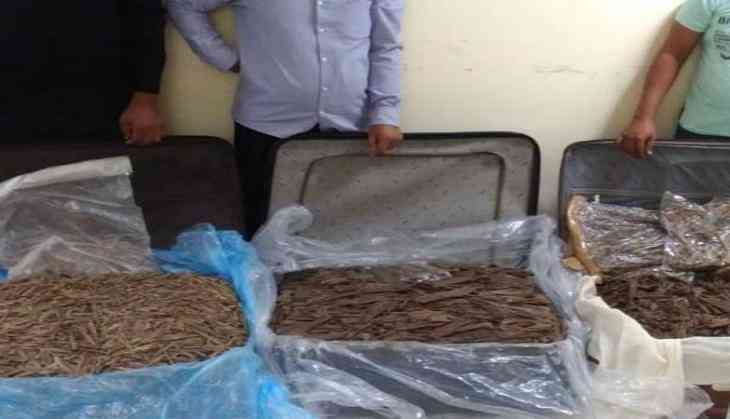 The Delhi Zonal Unit of Narcotics Control Bureau seized around 71 Kg of high quality Agarwoods worth crores from three people- Mohammed Somsul Islam, Mohammed Helal Uddin and Mohibur Rahman- in the security hold area of IGI airport, New Delhi. The three people, residents of Naigaon in Assam were travelling to Kuwait by boarding a connecting flight from Delhi to Mumbai for the onward journey. Further investigation is in process. Agarwood is in the list of restricted items which cannot be exported from India. Agarwood is in huge demand in the Middle East since the essential oil from Agarwood is used for manufacturing perfumes.